I’d been doodling and drawing since I was a little boy, honing my skills with years of practice — and sharpening my sarcasm on my poor, undeserving older sister. I continued to put those skills to good use on friends and underclassmen in high school. Soon I was in college, drawing for the newspaper, and stirring up controversy after controversy. Still, it’s one thing to dream. It’s another to live the dream. 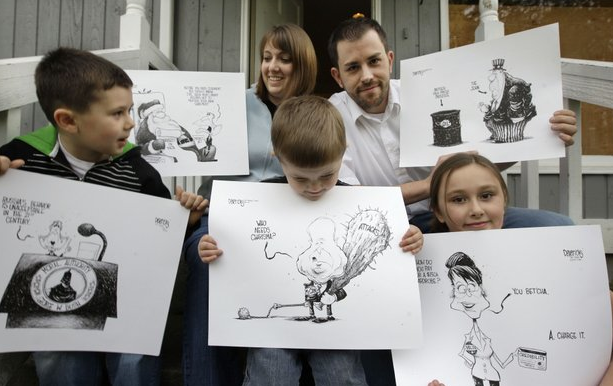 I knew I wanted to have a career in cartooning — but was that the best path for me and my family? And the answer came clearly, profoundly, unequivocally: Yes. It was the answer I’d wanted — but truthfully it didn’t make a lot of sense. I knew how few jobs there were. I knew the deck was stacked against me. But I resolved to reach that goal, even though I didn’t know how I’d do it. The very next day The Times called to offer me my dream job. How could I walk away from that experience anything less than convinced that this was the path I was supposed to take in life? But then, far more quickly than it all came together, it was over. I suppose I should have seen the writing on the wall. The newspaper industry has been in decline for decades. The economy was in the crapper. And the Internet was putting tremendous pressure on all print media. My tiny profession was getting tinier by the day. Still, when the news came that I would be laid off, it felt like someone pulled the floor right out from under my feet. And one thing consumed nearly all my thoughts: What the hell was I going to do? There were no jobs out there for me. My skills, I learned in the overcrowded land of the unemployed, were utterly un-transferable to any other profession. What was I going to do with my talent? What was I going to do with my life? And, most importantly — and most frighteningly — what was I going to do to provide for my family? I was angry and confused. I believe that when you ask for guidance, you get it. And I had gotten it. Now it was gone. It was devastating. At my lowest point, a good friend told me that he believed that people who had the ability to excel at any one thing had the ability to excel at any other. There’s certainly such a thing as God-given talent, he said, but that’s just a spark. The fire comes from hard work, initiative and dedication. I realized then that the focus, determination and competitive nature that allowed me to become an award-winning political cartoonist could be honed on just about any other target. This revelation brought me a tremendous amount of hope — though certainly not any immediate success. But three years after my old dream ended, new ones have taken over. With the support of my family and a close partnership of friends who drew me from the rain-drenched Northwest to sun-soaked Southern California, I’ve helped build one of the best design firms in the western United States. From golf clubs for Cobra Puma to speakers for Altec Lansing, we design products for some of the coolest companies in the country. Our services are in constant demand and we’re growing so fast that I sometimes get blurry-eyed. But let me tell you: It has been thrilling. Two years ago, we decided to try our hand at designing, manufacturing and retailing our own product. And two weeks ago, we officially “went live” with a new baby bath system called Blooming Bath. We think it’s an unbelievably cute solution to the problems of bathing newborns in a traditional baby tub — and it’s just about the best baby shower gift you could possibly imagine. The response has been overwhelming. Moms love us. Dads love us. Grandparents love us. And we’re pretty sure that babies love us, too — at least that’s what it seems from the ridiculously cute photographs we keep getting from their parents. Life is good. And just a few days ago, it hit me: I feel like I’m living a dream again. I know that many of you have been laid off over the past few years. I know that you are wondering, as I did, what happened to your life. I know that you are wondering, as I did, why your path needed to change. I don’t claim to have the all answers. Heck, I don’t claim to have any of the answers. But I don’t believe we’re ever given more than we can handle. And I don’t believe we ever have to stop dreaming. Sometimes we just need to dream another dream.